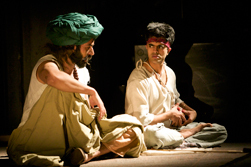 Founded approximately 20 years ago Tamasha is the British Asian theatre company that aims to transform theatre to create a space where British Asian talent takes centre stage. Young actor Divian Ladwa has worked with the company a number of times and his CV includes the productions, Strictly Dandia, A Fine Balance and The Trouble with Asian Men. He is starring in their UK tour of Wuthering Heights - which sees the classic novel transformed by the flavour and colour of Bollywood. ATN caught a few words with Divian so he could tell us more about the show. 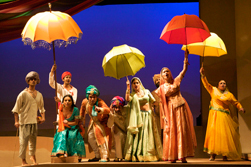 The play is a Bollywood take on the classic novel. How has Bollywood influenced the production? If you read the novel a lot of people have said it’s melodramatic; the characters and so forth. In our version we’ve emphasised the melodrama a bit more and we cut the story about half way as the novel also focuses on the second generation. Our play focuses more on Heathcliff’s character and Cathy’s character and looks at the romance and builds on it with the Bollywood melodrama and the Bollywood music to help the story along. What role does your character Changoo, play in the production? It’s a 1940’s style Bollywood film set in 19th century Rajasthan. If you wanted to listen to story or watch a play of some sort or in the 1940’s Bollywood cinema if you wanted to watch a film, you would get a couple of characters that are talking to each other and they would talk to each other about the actual story you’re about to see or hear – they’re kind of like narrators in a sense. So Changoo is being told a story by this guy he meets in a market. It’s a little bit similar to the actual book when Heathcliff is actually speaking to someone and telling them what has happened in his story. You have worked with Tamasha a number of times, what is it you like about the company? The two artistic directors, Kristine Landon-Smith who directs the plays and Sudha Bhuchar who writes them or sometimes acts in them herself. I enjoy working with them a lot. I call them Auntie Gee every now and then - they don’t like it but I still call them that anyway. I don’t see them as my bosses; I more see them as friends or family. Kristine also has a great approach to working with actors and they’re just a fine company and I believe in the stuff they do and some of my favourite things happen to be done by them so I’m really happy to be involved. It’s kind of like my dream come true. Why should people come and see Wuthering Heights? I think the people that know the book will have seen versions that are similar to the book, so to see it transported to something slightly different and with a little bit more colour and a little bit more spice will be a completely different change. But the story will be similar enough for them to still be happy with it so the book lovers will find it quite fascinating for that. For people who have an interest in Bollywood, to see a live version of it instead of something in the cinema will be another reason. The actors that are involved, the whole cast are great and they all give really good performances so for theatre goers, in general, just to see the guys do their thing and the costumes are amazing and the set as well. So theatre goers will love it, the book lovers will love it and people that have an interest in Bollywood will love it – in fact I can’t think of any reason why people shouldn’t come along only reasons to come along. Wuthering Heights was at the Lyric Theatre, Hammersmith from April 29 to May 23. The play continues on a UK until 20 June 2009. Afridiziak Theatre News > Interviews '09 If you can see this, your browser doesn't understand IFRAME. However, we'll still link you to the file.